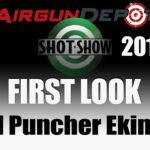 SHOT show 2019, I’m at the Air Venturi booth bringing you the first look at the new Kral Ekinoks. Now this is a semi-automatic bullpup, it uses a gas redirection system to actuate the bolt here, you pull it back first time, and you’re ready to go. You’ve got a nice Turkish walnut stock, adjustable comb, bottle-fed. It’s gonna come in .177 and .22 to begin with, we’ll probably get a .25 later on. We can expect these sometime in April, probably sometime in the spring at least. Price right now is $770 in US dollars. For more SHOT show coverage stay tuned.